Funny thing happened the other day. All of my guys on the trip have been on the Cabo Freak Fest trip and one of them on the Costa Freak Fest. And they all know that I don’t push them past their limits. In fact, I don’t push them at all. But what I saw them do in scary low tide four to six foot Padang Padang, reminded me of what I went through when I first came to Indo back in 1996. The guys were stoked to have waves for the first couple days of their Indo trip. But they really didn’t know what they were getting into that morning as the sounds of waves crashing crept through the darkness of our super dawn patrol. As we all waiting on Padang beach for some sort of light to come out, they stretched and I prepped my camera in the flashlight beam. I could tell that they were a little worried and excited at the same time. We all knew that the tide was going to be too low to ride but we were going to be out there when it turned on. 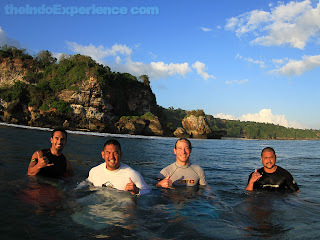 As we reached the line up in the wee hours of the morning, the waves surged onto an almost dry reef. I was able to stand on the reef as a wave came in and sucked the water down to my shins. The boys played it safe for the first few waves and as the confidence grew, they kept pushing each other deeper and deeper. Eventually, as the tide filled in, they were in the right spot to handle the perfect inside corner. Everyone got at least one solid ride and everyone hit the reef in one way or another. They are all okay and now they have a lasting memory of an epic session. The Push. The boys doing their thang. 2010 crew. Early sunlight. Padang Padang. So tight bro, I told Deborah about the Couples Trip and she said I was on my own for this one. :)) Great photos of the boys, keep it coming, so sick! Hey Ricky I'll roll with you! FFAT is awsome but the Indo Experience is off the hook!